I wish I could find photos like this for the Brooklyn. I have seen these pics before (on Bill Stewarts's "Great White Fleet" site), and, sadly, they are NOT of a Tennessee-class AC, but of one of the Pennsylvania-class ships. The clues are the glassed-in bridge being 1 deck lower, the arrangement of the casemate 6" guns, and the gaps in the boat-deck where you can look down to the main deck. They are, however, great shots of details that are the same between the classes. I was looking for Brooklyn photos when I came across these. They were referenced on the page as Washington, I just took it to be so. Thanks for pointing out they are not. Maybe someone should write the guy who posted these pictures and enlighten him. Anyway, I'm back to working on my model. I e-mailed the guy*, and he acknowledged my e-mail, but he never got around to re-labelling them. I have found other instances of Pennsylvania-class ships labelled as Tennessee-class on sites that should know better, and I even have a postcard from back in the day that is mis-labelled. *Actually, it was Bill Stewart's GWF site that got me started on the Washington! 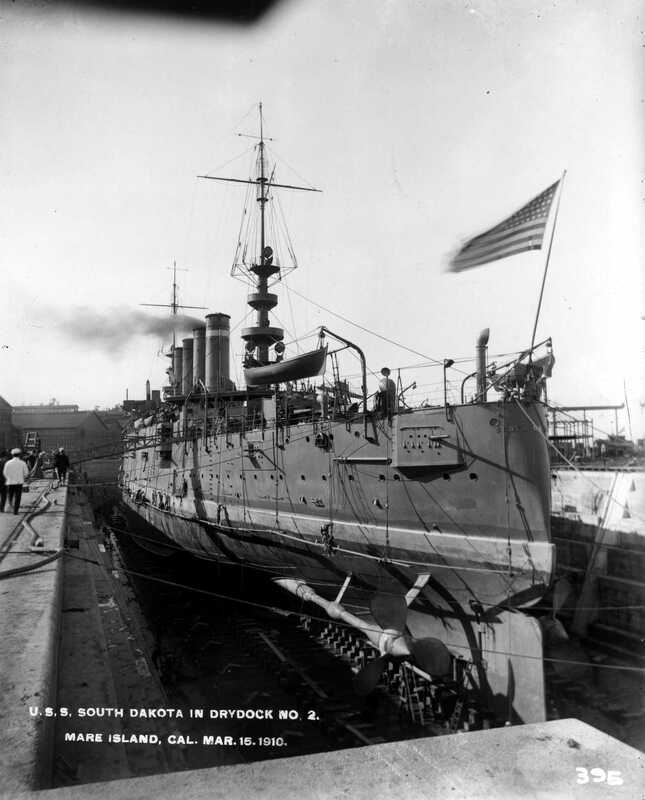 I found a good port stern view of ACR 9 USS South Dakota. If it doesnt eat up more than your monitor can display when it opens, click to enlarge for a great view! I'm starting to see construction simularities with all armored cruisers of the era. I'm also starting to notice paint schemes differed to what almost looks like a captains choice/interpretation of a navy order. In the photo the port holes seem to have a black accent and the name one the stern may be natural brass? I say that because it doesnt appear to be black, and the look of the letters at the begining of "Dakota" (or maybe I just cant see). I have seen the name in black on other cruisers in "war paint"
Anyone know the story on that? Nice! Free plans are allways good. I wish I had had those when I was drawing my own version. The missing decks would have been helpful. The pic is of the boat deck, with boats, crane, ventilators, winches, skylights, and numerous gra-doo. I also ordered some copies of other prints at great expense. How goes the NC, John? I'm working on the hull. I've got it about three quarters planked. Having never done a model this big (my last one was two inches long), It's taking rather longer than usual.